The solution is simple to Eject the CD or DVD Drive via the Desktop Context Menu or Keyboard Shortcut, how to? Please use the Keyboard-Shortcut [Windows-Logo]+[E] to start the MS-Explorer and Create a Desktop Shortcut to CD e.g DVD Rom Drive, via right Mouse Drag & Drop. (... see Image-1 Arrow-1). Read more: ... Eject the DVD via Keyboard Shortcut! See also: ... enable Windows-7, 8, 8.1 Quick Launch bar! and: ... Recycle Bin on the Desktop Task-Bar in Windows 8.1 for drag and drop to trash! 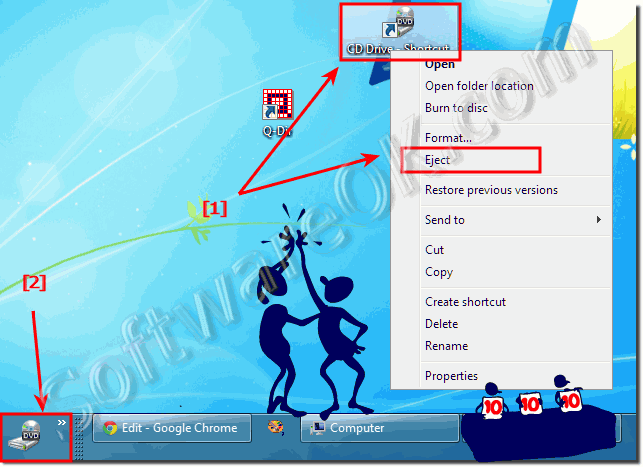 (Image-1) Eject the CD or DVD Drive via the Desktop Context Menu in Windows 7 or 8.1! Eject the DVD via Keyboard Shortcut! Windows-7 - FAQ-111: Eject the CD or DVD Drive via the Desktop Context Menu or Keyboard Shortcut, how to? Short key of dvd drive open in dell laptop? Direct key to open dvd in window 7? Dvd room how to open shortcut? Laptop dvd room opening shortcut key? Shortcuts to open DVD RW drive? Eject shortcut pc on keyboard? Tomany short cuts of cd rome drive? Shortcut of EJECTING Dvd drive? Eject dvd drive in windows 8? Short cut to open dvd drive windows 8? Keyboard command to open cd drive? Windows 8 shortcut to eject dvd? My windows 8.1 send to menu does not show cd drive, Dvd eject button for windows 7? Keyboard commands to insert dvd? How to eject cd from cd rom windows 7? Keyboard shortcut to eject cd windows 7? How to close optical drive using desktop shortcut? Keyboard Shortcut to open the cd drive in windows 7? Short keys open a dvd rom? Keyboard shortcut windows 7 CD ROM eject? How do open cd drive from my keyboard? Keyboard shortcut to open cd drice? Shortcut key of cd dvd writer eject? How to eject dvd drive with keyboard windows 7? Short key eject dvd driver in windows 7, how to eject a dvd in windows 7 from keyboard? How to ejecj cd using keyboard cmnd? How to add a drives in desktop context menu? Eject optical drive cmd Windows 7, Shortcut,ejecting CD ROM? Eject cd drive windows 7 shortcut? Cd drive eject keyword sutcurt? Eject dvd key in windows 7 or keyboard shortcut open cd drive? Program to open and close dvd drive with keyboard windows 8.1? Dvd eject for windows os shortcut key? Shortcut keys to open dvd drive? Shortcut to open disl drive on windows 8? What keyboard combinations open a dvd rom on windows? Keyboard shortcut for opening cd or dvd drive? Open cd drive keyboard shortcut? Keyboard shortcut windows 7 eject cd? Eject drive on windows 8.1 using keyboard? Eject shortcut key keyboard windows 7? Shortcut key for dvd eject?